Is Manchester The UK’s Coolest City? Some clichés about the UK’s biggest northern city are true. Mancunians are football mad. Teenagers strut around in Adidas pants trying to look like they’re looking for trouble. It rains or drizzles an average of 152 days a year, and though it’s only two hours by train from London, Manchester maintains an outsider feel underlined by thick Northern accents. But you knew all that, right? Here are eight more things you probably didn’t know about Manchester. I thought I knew about Manchester’s red brick warehouses. The industrial revolution began here, so I anticipated canals and old cotton mills. I’d seen 24 Hour Party People and videos by The Smiths. But I didn’t expect so many. You can’t forget you’re in Manchester for a moment. The most exciting red brick edifice for fans of The Smiths is Salford Lads Club. You can stand before the sign like The Smiths did for the sleeve of 1986 album The Queen Is Dead. In 2004, tired of fans writing on the wall, the club opened a special Smiths Room (which is open Saturdays). An estimated 28 hotels opened in Manchester last year and the population has apparently tripled in 10 years, with many newcomers priced out of London. Cranes jut from every horizon and coffee joints, cafes and breweries are opening apace. On top of that, the BBC has moved a large slice of its operations to Manchester’s MediaCity. MediaCity stretches over 200 acres on Salford’s docklands and houses several TV production companies. All those media workers get thirsty after work – enter “molecular mixology” cocktail bar, Alchemist, due to open in MediaCity soon. As extra proof, I talked to a DJ and producer who’d just moved back after five years in Berlin because Manchester was “more exciting”. Mark E Smith of The Fall still drinks at The Dry Bar in the Northern Quarter. 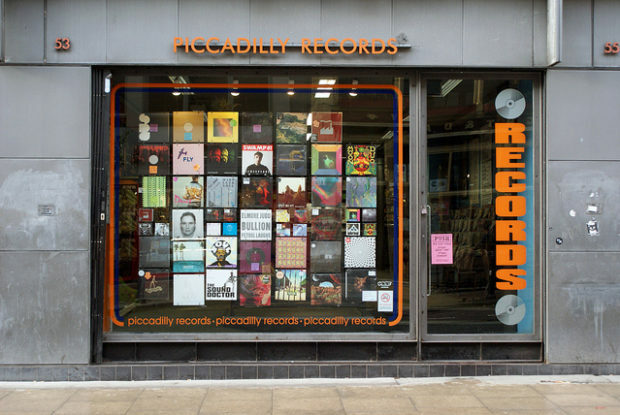 The Happy Mondays still waft around and Guy Garvey of Elbow hangs out at favourite local haunts Piccadilly Records, The Refuge restaurant, and Night and Day café. Lead singer of The Charlatans, Tim Burgess, is seen around as is The Stone Roses’ singer Ian Brown. And if you take the tram eventually you’ll spy seminal BB6 music DJ and alternative music advocate, Mary Anne Hobbs. In the ’90s, Manchester’s crate-digging circuit was legendary. The internet maimed it, for sure, but four record stores still trade within spitting distance of each other in the Northern Quarter: Piccadilly Records, Eastern Bloc Records, Vinyl Exchangeand Vinyl Revival. Oasis fans should head out to Sifters in Didsbury, made famous by the song ‘Shakermaker‘. Record shopping in Manchester is fun. Employees aren’t snooty and it’s standard practice here to offer turntables and headphones to try before they buy. So if you’re wondering “would this sound better on vinyl?” you can find out. A cheap-and-hearty “rice and three” is a Manchester dining staple (rice with three curries). Kabana, This n That and Al Faisal are sure bets. If you venture to The Curry Mile in Rusholme, locals swear by Mughli. Mancunians love their butty (sandwich) bars, too – these humble places jam all day. Upscale dining is on the rise, as well. The Rabbit In The Moon, Grafene, Squid Ink, and The French come recommended if you have pounds to drop. The palatial downstairs area of the Principal Hotel, meanwhile, was re-opened last year as Refuge by Volta. It’s a partnership with local DJ duo, The Unabombers, with food inspired by their “global DJing trips”, which explains why there are decks in the corner. The founder of the British suffragette movement, Emmeline Pankhurst, lived in Manchester. She founded the Women’s Social and Political Union (WSPU), which deployed radical tactics to fight its fight. Windows were smashed, police officers were assaulted, and Pankhurst was arrested seven times. She was force-fed during a hunger strike in prison but did not give up. Women were granted the right to vote in Britain 1918 (New Zealand was first in 1893, followed by South Australia in 1919). The Pankhurst Centre was Pankhurst’s home and where the WSPU first met. Run by volunteers, it is only open Thursdays. Given Manchester’s reputation is forged on football and a music scene dominated by men, this is a missed opportunity to showcase a story about women. Fans of Factory Records and bands like Joy Division or the later Madchester scene should know the iconic club of label owner Tony Wilson, The Haçienda, now exists in memorial plaque form only. It was demolished in 2002 and rebuilt as exclusive apartments. The property did, however, license the name from New Order’s Peter Hook. It’s called The Haçienda Apartments now. So it goes.